Turn this fun learning activity into a holiday gift for a friend! The holidays are a wonderful opportunity for children to learn about your family's cultural traditions, as well as those of your friends and neighbors. If you're looking for a fun learning activity to teach your children more about the reasons for season, ask them to draw you a picture of their favorite holiday celebration on a piece of card stock. When they're finished, ask them about the pictures and images they used and discuss the meaning behind these symbols. Take the project a step further by turning their artwork into a fun jigsaw puzzle. You can draw the outlines of the puzzle pieces with a thick marker and let your child practice cutting them out or you can cut them out yourself. When you're finished, help your child put the puzzle back together. 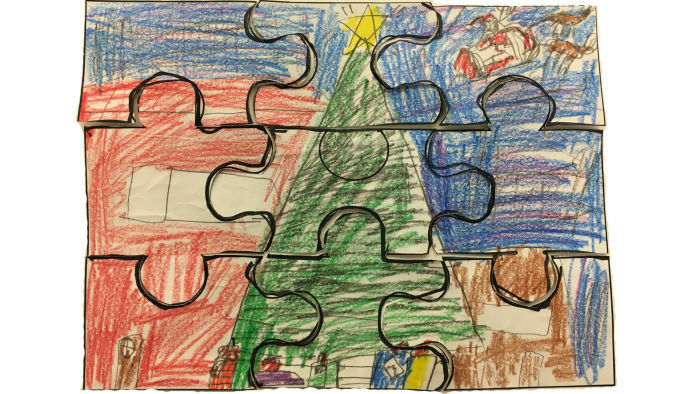 Encourage your child to give the puzzle as a holiday gift to a friend or loved one. Get a sheet of card stock or cardboard. Decorate with pictures and symbols of your favorite holiday traditions. Ask your child about the symbols and images he or she has chosen. Cut the card stock into a dozen oddly-shaped pieces. Mix the pieces up and spread on a table. Have fun putting the pieces back together or give as a gift to a friend or loved one!